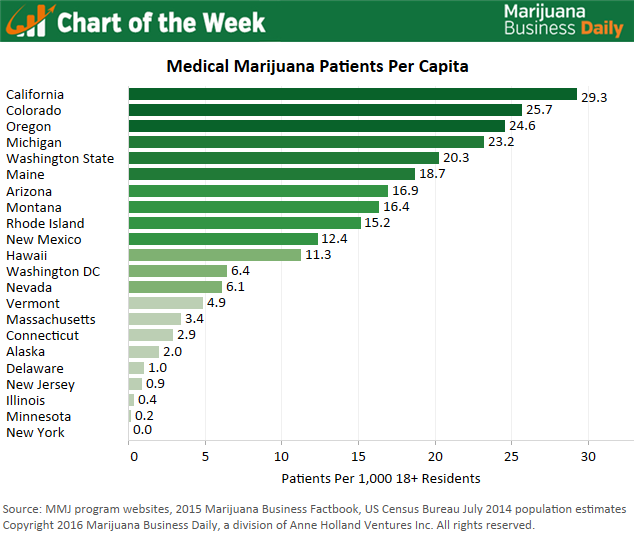 The number of medical marijuana patients in any given state depends on myriad factors. But certain variables are more influential than others, and analyzing them can help entrepreneurs evaluate the size and potential of a specific market. Take the qualifying conditions list, for example. Illinois by far has the longest list of specific conditions, yet it has one of the lowest MMJ patient densities per capita at less than one per 1,000 adults. By comparison, Colorado has one of the shortest conditions lists, yet it has the second highest density per capita at 26 patients per 1,000 adults. So what’s driving this difference? When allowed, generalized severe and/or chronic pain are by far the most commonly cited qualifying conditions for adult patients, while seizures takes the top spot for minors. Colorado allows MMJ recommendations for severe pain, whereas Illinois does not. Post-traumatic stress disorder has also proven to give a healthy boost to patient counts when permitted. In New Mexico, for instance, it is currently the most commonly cited condition by patients. But qualifying conditions aren’t the only consideration. New York requires physicians to undergo a state-approved training course before they are permitted to recommend MMJ, limiting the number willing to do so (and therefore patient access). Illinois requires patients to undergo full background checks and fingerprinting – invasive measures that have certainly kept a number of would-be patients away. New Jersey has some of the highest prices in the country. When coupled with the fact that no products – including flower – can contain more than 10% THC, it has created a situation in which most patients continue to rely on the black market. Other influential factors include caps on dispensaries, local moratoriums that leave communities without legal access, restrictions on MMJ products or consumption methods, and whether home cultivation is permitted.